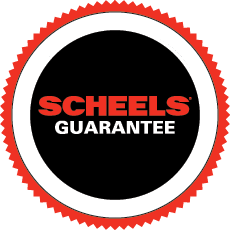 I’ve been with Scheels in Lincoln, NE, since 2014. My passion for volleyball however, began when I was in grade school. After playing in high school and in college, I now mostly play in leagues on week nights and tournaments on the weekends. I’m still in contact with some of my teammates from college but what I wouldn’t give to be back out on that court playing with them! After college, I started coaching club volleyball for an area select team and absolutely loved it! You might be surprised but Lincoln actually has a pretty great volleyball community that has become sort of a little family to me. Since volleyball can be played in so many shapes and forms, it’s really opened up a lot of avenues for me when it comes to meeting all types of players from around the country. Lucky for me, a lot of these people have turned into lifelong friends who I would be lost without! One of my favorite tournaments to play in Nebraska for indoor and outdoor is ran by two of my friends who donate the money to certain causes which will always hold a special place in my heart. Raising money for those in need while getting to play volleyball, who wouldn’t want to do that? !